What is the current evidence on nonpharmacologic techniques for pain management? Besides opioids, what is new in systemic analgesia? NSAIDs, APAP, ketamine, alpha-2 agonists, and butyrophenones are reviewed. Regional and local anesthesia can avoid the risks of systemic analgesia or procedural sedation, but what are the best agents and additives to use? What are the easiest and most effective nerve blocks to use for the hands, face, chest, shoulder, and hip? Pain management through nursing protocols and patient-controlled analgesia are showing promising results – is your ED using them? What is new in ED management of chronic pain, and what can be done about drug-seeking behavior? CME: This enduring material includes 4.5 AMA PRA Category 1 CreditsTM. 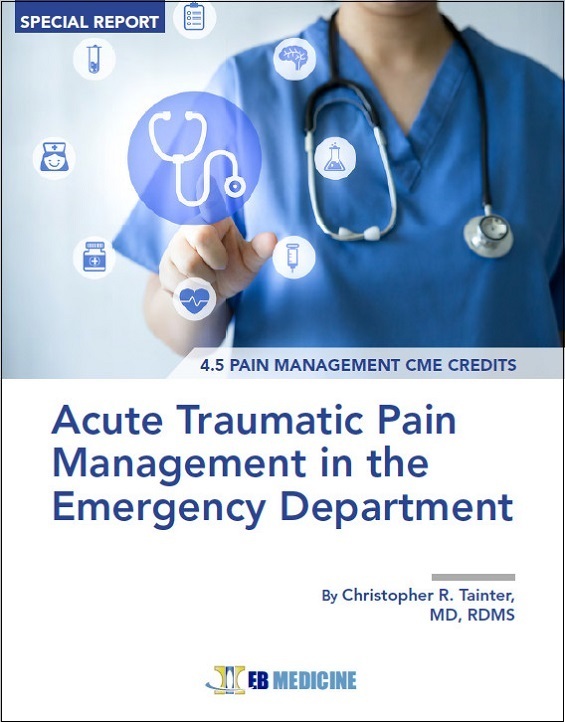 Included as part of the 4 credits, this CME activity is eligible for 4.5 Pain Management CME credits and 4.5 Trauma CME credits. I enjoy the links to demonstrations of regional anesthesia techniques. I found it very helpful, especially the links to the video demonstrations. Excellent article - I did a nerve block for a hip fracture after reading this article. Outstanding article - good mix of pharm, non-pharm, and procedural medicine. This is a very important topic and one that improves our patient's perception of care.